If you have been following our tiny house journey or are at all close friends with us…you know that this tiny house build has been a long time coming! Though, in retrospect…I have to say, for two amateurs that recently became parents and have traveled a bit in the last 2 years(and dont get me started on our battle with the weather! )…I would say we are doing pretty good. Little Odette and I watching Aaron work on the Tiny House. With that said, we have not completed this project as soon as we would have hoped but with that comes reality! For anyone curious in building tiny or honestly, building any building at all – designing and gathering all the needed material takes a lonnnng time. There were months spend simply designing the floor plan and layout, having to dig deep to truly decide what could we live without and what was essential in our tiny house design. We had a space significantly smaller(yes, by choice) then most houses yet we needed to include all the same components any other house has! 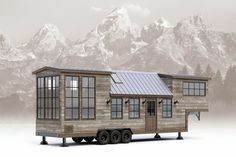 Exterior 3D Model – This shows the exterior plans of the Tiny House in 3D space using sketch up. Interior 3D Model – This shows the interior plans of the Tiny House in 3D space using Google Sketch Up. The bathroom layout has since changed but only slightly. The nook you see here to the left under the bed – that is now under the stairs with the bathroom door opening now where the nook is in this picture. Talk about a lot of decision making before you could even think of swinging a hammer! So in short, thank God the design phase is over, the structure is built, and we FINALLY have a rough-in plumbing plan! So that mean we are working on the guts – something I feel is a slippery slope towards the finish line! And let me tell you, that EXCITES me! All that’s going through my mind is, ‘You mean to tell me…I may be able to live in my tiny house before the end of the summer? REALLY?’ At least that is our current goal but if all else fails, we should most definitely be in it before the end of the year…and to me, that makes me more then happy. Soon the interior of the tiny house will be done like the exterior is! To see such a huge project complete and to have for the first time in our young lives a home we truly own…will be, for lack of better words, happy-cry worthy! So where does this put us now? Well, we have drilled holes for the drains – shower, sewage, and sinks. Shower drain has been drilled and put into place! We have installed the shower pan, it’s in for good. And we have purchases much of the ABS pipes, our sinks, faucets, PEX tubing, ventilation fan, and various other materials to complete the rough-in plumbing…and let me tell you, this was a task! Some of the ABS pipe assembled, this will be hung under the house. The decision making doesnt end when you’ve decided on the floor plan…no, its only just begun! What kind of cabinets will you get? What material will you use on your interior walls? Tile, wood, or fiberglass shower? Stainless steel, chromo, brass, etc faucet? I feel like I am an inconvenient mix of being frugal, appreciating quality, and knowing exactly what I want. So when it comes to things like…the corrugated metal siding & roofing, bathroom/kitchen size, and our rustic chandelier…I pretty much am unable to compromise. Which then means, the hunt is on. How can I do that affordably? How can I rearrange the space to make it work? Where can I buy the material? Can I spend way to many hours on the internet to find just what Im looking for? My awesome husband holding our bathroom sink faucet! I have long since decided that I was going to have antique copper finished fixtures…but after receiving reality checks from local suppliers and online shops…antique copper is quite possibly one of the most expensive finishes I could have dream for. However…I didnt want the dream to just die! It couldnt because no amount of scrolling through my Tiny House pinterest board to find almost all of the Tiny Houses I pinned had chrome finished faucets would change my desire for copper. So…the hunt began. Ebay, Google, Amazon…and I found it! This discontinued model, that runs over $250 almost anywhere…I found an auction on ebay for around $80 dollars…which after tax and shipping costs, I got for around $100. I mean just take one more look at it! Who wouldnt want such a gorgeous faucet in their bathroom? Our Danze Opulance antique copper finished bathroom sink faucet and narrow ikea sink! So here’s to moving forward! Can you pray with us that we can understand all that we need to understand, find all of the remaining material at an affordable cost, and piece together the interior of our home well? We are so thankful for all the supportive people in our lives that have been encouraging us on this journey of completely DIYing our Tiny Townley House debt-free! If you have any questions on our Tiny House build we would love to answer it! Until next time, dont forget to pin this post so other people can join our Tiny House journey!